For the other versions of the Shade turret, see Shade. The Type-26 Anti-Infantry Stationary Gun (T-26 ASG) is a Covenant anti-infantry gun turret. It is one of the weapon emplacements falling under the Shade category, and the most common variant deployed during the Human-Covenant War. Mounted on a 360-degree traversal mount, the T-26 ASG fires two bolts of slow moving, high powered plasma encased in magnetic fields. The accuracy of the weapon is fairly low, as the bolts of plasma fired can hit anywhere within the aiming reticle. The T-26 ASG is in the shape of a ball-turret, has a higher rate of fire than the other iterations of the Shade, and provides excellent front and side protection for the gunner. Like other versions of the Shade, it is elevated on a small gravity lift that hovers the turret in the air, and so has a full 360 degree field of view. Interestingly, the turret's aiming reticule is similar to a Type-33/Type-56 Needler's, except with a circle of lines at the center. The Shade is effective against most infantry. However, due to their high intelligence, Sangheili will often find cover and escape its range of fire. On this same note, the bolts lack the required punch to damage Mgalekgolo, whose armor and combat shield can withstand most Covenant and UNSC small firearms. The T-26 ASG has shown good defense against light vehicles such as the Type-32/Type-54 Ghost, and in desperate situations, can serve as anti-aircraft defense, requiring only a few direct hits to destroy a Type-26/Type-54 Banshee. The T-26 ASG is very effective against both enemy ground forces and light vehicles. Some of its advantages over its human counterpart are that the plasma bolts are accurate and effective at longer distances and it is easier to see where shots are actually going than it is with the M41's rounds, although this might also affect the ability of the target to dodge them. As with the human counterpart, the player will be exposed to enemy fire. While it is useful against enemies in light vehicles, this is not a weapon of choice when facing an enemy armored vehicle. Also, as is the case with the M41, players are unprotected from the rear. Additionally, the Halo 3 version of the Shade has an extremely slow turning rate, making it a detriment to the user. And the Shades' rate-of-fire is slower than that of the M41. The T-26 ASG has interchangeable components, allowing greater specialization into various roles. A more rarely seen variant, the fuel rod Shade is armed with a single fuel rod cannon. The variant is typically employed in an anti-air or anti-armor role, but is devastatingly effective against infantry. The turret chassis is iridescent green as opposed to the maroon of the standard anti-infantry version. Armed with twin heavy plasma cannons with explosive bolts, the anti-air Shade is used to repel enemy aircraft. The AA Shades bolts have limited range, as they explode after traveling a certain distance. Though its chassis is based on the Type-26 variant, the anti-air shade possesses an energy shield to protect the operator. The Halo 3 iteration of the T-26 ASG. The T-26 ASG was introduced in Halo 3. The Shade was in multiplayer only in Halo 3 Epsilon, as it was removed from the final version, even in Forge. Modders are still able to mod the game to get the Shade on certain maps. In Halo 3: ODST, the Shade seems to rotate more quickly than in Halo 3. It is also worth noting that in Halo 3: ODST, the Shade lacks a plate of armor in the top middle, in between its guns, exposing the operator to enemy snipers. In Halo: Reach, the T-26 ASG appears to have a similar overall design as the ones in Halo 3 and Halo 3: ODST, although it is considerably lighter armored. The Shade is now usable in multiplayer and can be added into custom maps via Forge. It also has regained the Halo: Combat Evolved fire rate, albeit with the plasma bolts of the Halo 3 Shade. The flaps at the side will no longer cover the user instead giving the user more angular cover. Two more variants, the anti-air variant and the fuel rod variant, are introduced. In Halo 5: Guardians, the T-26 ASG remains similar to its Halo: Reach counterpart. 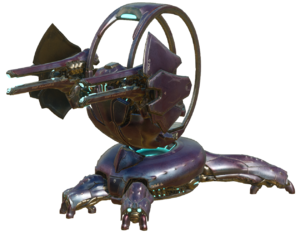 The anti-air Shade turret also returns, although it is now usable by the player, but it no longer has energy shielding and is now weaker than the standard Shade. The anti-gravity base supporting the gun now includes four prongs. Should a Shade be destroyed, it leaves behind burning wreckage. If a player touches the wrecked Shade's burning anti-gravity base, they will take damage from it. Heavy weapons, vehicles, or grenades are perfect for destroying Shades. In Halo 3, if you shoot a Shade from a distance and in the middle between the two pieces that jut out, the operator might jump out. 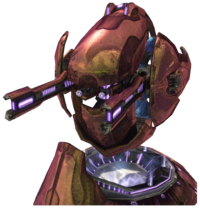 In Halo 3, if you stand right in front of the turret, in between the guns, the operator will not turn the turret to make you slide in front of it, making you a harder target. In Halo 3: ODST, Automags and snipers can be used to kill the gunner if no heavy weapons can be found. Ramming it with any vehicle at speed is an instant kill. Precision weapons like the M392 and M395/M395B DMRs and Z-250 LightRifle are very useful for shooting a Grunt operator out in one shot, and it can even kill an unshielded Elite from adequate cover. The Warthog and Chopper are the best vehicles to ram the Shade head-on. In Halo: Reach, a Scorpion Tank can destroy a Shade without worry of being hit from far distances with a single direct shot. In Halo 5: Guardians, the Phaeton's evasive maneuvers are recommended for dealing with anti-air Shades. In addition, Phaeton pulse missiles can lock onto Shades. Neither the Power Drain nor an overcharged Plasma Pistol shot can disable the Shade's firing mechanisms, though either of these will temporarily disable its ability to rotate. In Halo: Reach, if an enemy overcharging its Plasma Pistol enters the Fuel Rod variant of the Shade, the Shade will lose its need for cool down time and fire at an incredible rate. The Shade is one of the few non-static Forge objects to change color with its team in Forge. Changing the team association and/or the object color results in the base to change different shades of that color. The upper portion of the turret may also change colors in game, but this does not seem to happen all the time. In Halo 5: Guardians, if a destroyed Shade is not despawned, its anti-gravity base can be moved around with a Ground Pound, allowing players to see a destroyed Shade's base without the flames on it. This is only possible with the Cowbell skull on or increased knockback from Ground Pounds in Custom Games. If the player moves away from the Shade's original spot and comes back to it, the flames will return to where the Shade was originally destroyed. Sometimes, any players who step on the flames will see damage indicators on their heads-up display, but will otherwise take no damage. Also, on co-op, the destroyed Shade's base still damages players who touch it, though, but no damage indicators appear on their heads-up display if the flames are away from the base. In solo, the flames will damage all characters regardless. In addition, players who are damaged by the destroyed Shade may complain about friendly fire, depending on who destroyed the turret. A close up of a Type-26 Shade's plasma bolt in mid-flight in Halo 3. Render of the Shade in Halo: Reach. A turnaround reference image of the T-26 ASG in Halo: Reach. Turnaround reference of the fuel rod Shade in Halo: Reach. An anti-air Shade in Halo: Reach. The fuel rod variant of the T-26 Shade in Halo: Reach. HUD of the fuel rod Shade in Halo: Reach. HUD of the Shade by Fred-104 in the Halo 5: Guardians campaign. Olympia Vale using a Shade in Halo 5: Guardians. A Sword Shade in Halo 5: Guardians. The interior of a Sword Shade in Halo 5: Guardians. Anti-Air Shade in Halo 5: Guardians. An Anti-Air Shade aboard a Type-55 Kraken. HUD of the Anti-Air Shade by Edward Buck in the Halo 5: Guardians campaign. HUD of the Shade in Halo 5: Guardians. HUD of the Anti-Air Shade in Halo 5: Guardians.